It seems that there has never been a better time to pursue marijuana jobs for entrepreneurs. Using data pulled from The Bureau of Labor statistics among other sources, NerdWallet compiled a list of the best industries for entrepreneurs in 2017. Not surprisingly, Marijuana was second on the list behind healthcare. Business is booming in the legal cannabusiness and everyone wants their slice of the pie. Cannabis dispensaries, grow operations, edibles kitchens, websites and apps have been proliferating around the country with increasing speed as more states allow for adult marijuana sale. Since federal mandates have kept the cannabis industry from breaking across America, hopeful entrepreneurs are betting on the industry as fertile ground for business development. Even skeptics can’t deny the impact legalization has had on certain industries like tourism and distribution. As the business moves from black market to legal market, a cornucopia of kush positions are cropping up. The following represent marijuana jobs for entrepreneurs with the most room for growth. Naturally, one of the cannabis industry’s ripest sectors for development is in website and app creation. Recent years have shown exponential increases in web development with the intention of making it easier for customers to purchase weed and for businesses to sell it. Not surprisingly, web development is one of the hottest marijuana jobs for entrepreneurs as the world moves deeper into the online world. Two of the marijuana industry’s most popular websites, Leafly and Weedmaps aggregate cannabis dispensaries and delivery services across the U.S. to make it easy for customers to find shops, view menus and prices. Currently, it’s unlikely that established dispensaries in any of cannabis culture’s hottest cities would abstain from enrolling in at least one of the aforementioned services. Though expensive, websites like these are a primary source of marketing for competitive businesses. Cannabis industry web developers have a powerful position in the industry, as they shape the way businesses and consumers interact online and on their phones with the cannabusiness. Another avenue that carries significant potential for entrepreneurship are marijuana consulting jobs. Consultants use their skills as lawyers, businesspeople and accountants to advise new and future business owners through the lengthy and convoluted process of legally operating. While the confusing legislation may irritate business owners, it has increased the need for cannabis industry consultants. Regarding finances, some consultants run accounting firms that navigates business owners through a cash-based, semi-legal industry. Consultants can wear many hats, assisting businesses with staff training, marketing and security protocol, among others. As far as marijuana jobs for entrepreneurs go, being a consultant has one of the greatest opportunities for high payouts. One of the most in-demand marijuana jobs for entrepreneurs is concentrate creation jobs. Cannabis concentrates are substances made using solvents that extract compounds from cannabis plant matter. Since concentrates contain high levels of THC and CBD and are more pure than flower, medical and recreational marijuana customers are champing at the bit to purchase concentrates. Concentrate extraction is carried out in a laboratory setting by extraction technicians, who use their skills as chemists to carry out the potentially dangerous process. Entrepreneurs looking to establish a concentrate business should be aware of the difficulty of acquiring business licenses. Many states award only a select few individuals with licenses, making it difficult for cannabis dispensaries to keep up with consumer demand for concentrates. Like concentrates, marijuana edibles jobs are taking the industry by storm. Long gone are the days of firecrackers and brownies dominating the market, now there are edibles that come in all shapes and sizes. Additionally, legal edibles are tested for consistent cannabinoid concentration in order to give customers an accurate idea of how much cannabis is contained in each treat. The process of cooking edibles can be done using traditional cannabutter and oil or concentrates. Cannabutter is a substance that results from decarboxylating cannabis flower or trim, and cooking it on the stove in butter or oil to infuse cannabis compounds into the fats of the butter. Special attention must be paid not to overcook the cannabis on too high a heat, otherwise it will actually lose THC concentration. Finally, the butter mixture is cooled, then strained. This finished product can then be infused into edibles. Although some edibles kitchens still go this old-fashioned route, others opt for concentrate infused edibles, as the taste of the cannabis is more subtle and less earthy than traditional butters. CO2 extraction especially is popular among edibles companies looking to provide the tastiest product with a high THC/CBD concentration, with minimal plant taste. Owning or running an edibles kitchen involves many of the difficulties associated with establishing a concentrate extraction operation, but fortunate individuals have the ability to make significant revenue based on industry desire for THC treats. One of the most popularly pursued marijuana jobs for entrepreneurs is dispensary ownership. With all of the legal pot shops appearing on street corners, strip malls and backroads across the west coast and Colorado, eager businesspeople are looking to set up their own business in hopes of capitalizing on the demand for products. Dispensary ownership can be lucrative, but it also carries the potential for significant regulatory strife. Owning a dispensary involves strict compliance with legislation and utmost care following the rules of daily operations. Additionally, some states award dispensary licenses through a lottery system, making it possible that prospective owners would have to wait months or years until being able to open a business. 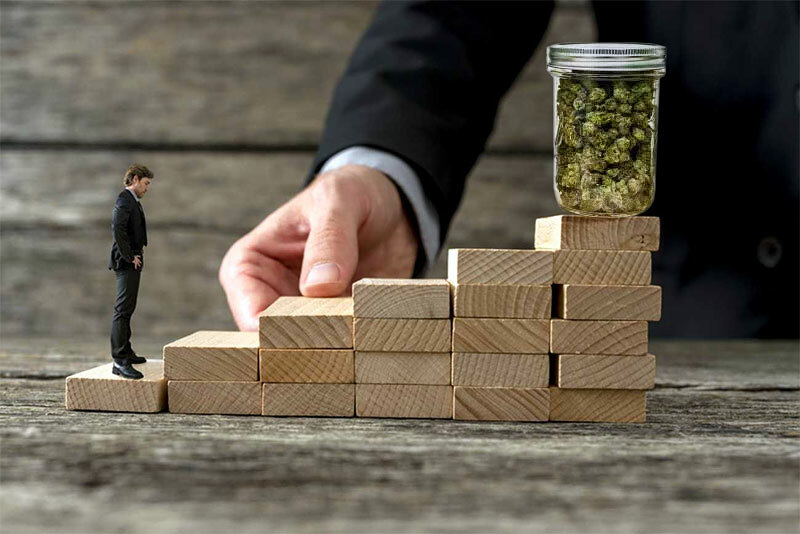 Becoming a successful entrepreneur in the cannabusiness takes a shrewd and passionate individual who is aware of the many roadblocks and opportunities this newly legal industry presents. From the outside, it appears that the cannabis industry is easy picking for business minded individuals, but candidates should be aware of the implications this complicated industry presents. This cannot be stressed enough. It is integral that all entrepreneurs be up to date on the many regulations and difficulties associated with this industry. Perhaps one of the best routes to take when pursuing marijuana jobs for entrepreneurs is to get advice from current industry professionals. Successful business owners can be an entrepreneur’s best friend, offering suggestions for the best way to go about establishing a business. Part of what makes the cannabusiness especially confusing is the changing nature of the laws. When most states pass recreational marijuana laws, there is a provisional period where regulatory boards allow for temporary operational laws until exact regulations are decided upon. This can be especially confusing for business owners and consumers whose cannabis buying/selling experience is changed at a moment’s notice. The state of Oregon recently finalized dispensary operation regulations to begin on January 1st, 2017. After a year and a half of deliberations, medical dispensaries became officially severed from rec. pot shops. Up until this point, Oregon medical dispensaries were allowed to sell recreational products as well, increasing their revenue. After the split, medical dispensaries are now at risk of earning glaringly less yearly revenue and losing a solid customer base. There’s no use getting into the cannabusiness if you aren’t passionate about it. While it may seem like an obvious avenue for entrepreneurial development, the industry is most suited to those who are aware of its medical implications and consumer base. Even in states where adult cannabis sale is legal, the marijuana industry as a whole is still somewhat of a grey market, thanks to the federal government. Even as momentum grows, cannabis still has its fair share of dissenters and problems with operations. If you look at the industry today, you’ll find that the most successful individuals really care about cannabis and have dedicated their professional life to the controversial plant. In fact, some individuals have risked working in the black market industry before hitting it big with legal bud. While it might be most appealing to open a dispensary or establish a grow operation, it’s important to have an open mind when pursuing marijuana jobs for entrepreneurs. There is plenty of growth in ancillary industries with marijuana tourism jobs and other travel-based industries. Now may be a great time to take advantage of the fecund industry, but it’s best not to rush into marijuana jobs for entrepreneurs before gaining the right experience to confidently run a business. Working as budtender or trimmer is a great way to make industry connections and build your knowledge of cannabis products and legislation, as well as gain valuable hands on experience with the plant and its many iterations. As the cannabis industry continues to grow with exponential comprehensive legalization across America, greater numbers of marijuana jobs for entrepreneurs will make themselves available. With enough knowledge, passion and hard work, the possibilities for business development are endless. The road to professional and financial success with marijuana might be fraught with trials, it’s a destination worth pursuing, especially as the formidable medical powers of cannabis continue to become evident.